The other night when I was running out the door to spend a long time in a dark car I had to improvise some travel knitting, which is my excuse for knitting so much of this hat for myself. 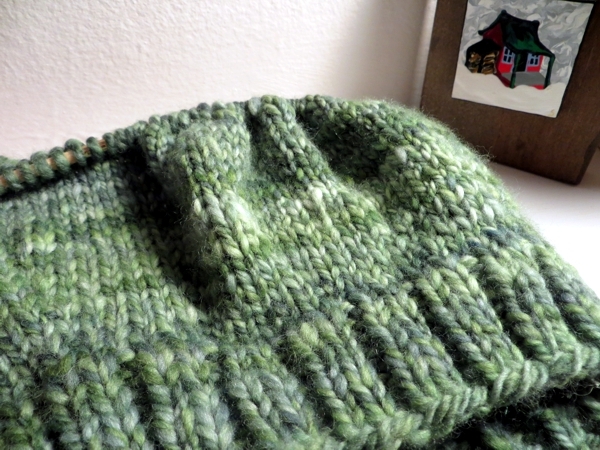 Well, the lack of portable Christmas knitting, and the bulky nature of the handspun Polwarth yarn I'm using. Seriously - when I got into the car (passenger seat, in case I need to clarify) I had the ribbing plus one exciting round of stocking stitch done. But it's just very very fast to knit up chunky yarn, even with stingy 5mm needles which were all I had handy at the time I cast on. When I got home later, I was all the way to here, and out of that particular hunk of yarn at the very moment I want to start the decreases at the top. This could make things interesting, because each one of the hunks of this handspun are a slightly different weight and all I had left to choose from for the rest of the hat is something marginally thinner. I'm hoping that will aid in the look of the decreases, as opposed to just making it look weird. Of course, the hat could look weird anyway. I'm still - after at least a year of off and on trying - working out how to adapt the whole 'slouchy hat' idea. It's not a shape I wear well personally, but I love how warm the extra fabric is and how relaxed it looks on other people, so I'm hoping one day to find a version that could be my go-to hat. It's anybody's guess at this point whether this one will be it. It should be warm though: it measures 1/4" thick at the outer edge and did I mention the 5mm needle? That fabric is dense. And it's green, which is a great colour for me, and an even better one for Christmas. H'mmm. Maybe I should move it up the queue, in spite of the gift knits, so I can look festive this holiday season? It's not impossible to do straight knitting by feel, making a dark car a perfectly adequate venue for knitting. But based on past experience where I mess up anyway, and knowing that the overhead reading light in a car can be very distracting for a driver, I brought along a little book light for emergencies. This was smart because in the end I had two of them. And then, thanks to the light, when I was close to being out of yarn I noticed I made a mistake in the placement of one of the increases toward the beginning. I'm pretty sure it won't show though, especially after I put a pin over that spot, ahem. Tomorrow: more knitting. After a week or two of hardly being able to do any, I'm getting in tons of knitting time. Yay! and shhhh to the laundry and dishes and meal-making and cleaning and seeing anybody ever. Just shhhh.